Creators, it’s time to improve eYeka.com! Hello everyone, We are proud to announce the launch of a global program to help us get your feedback, suggestions and ideas on eYeka.com. As you probably noticed, we have been very busy improving our business model, looking for more scalability and getting brands to launch great contest for you to join. Now it’s your turn! We have big plans to improve eYeka.com (and loads to do!). And we want your help to understand what works, what doesn’t, if the website does the job, what pages are great, and most importantly, which aren’t. 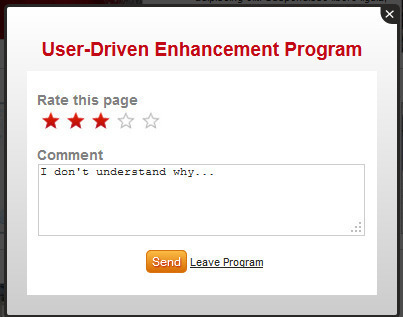 At your next login, a pop-up will ask you if you want to join our User-Driven Enhancement Program. If you want to be heard, join! (You can join or leave it at any time in your “My preferences” page) First, a 5 questions survey will allow us to calculate your global usability feeling. Once completed, you will be able to rate and add a comment on each page (at any time you can edit it). As you will notice, a Feedback tab will appear just below the Support tab.